Dr. Diana Pate received her Doctorate of Veterinary Medicine from the University of Tennessee. Following a small animal surgery and medicine internship at University of Georgia and an additional year as the UGA triage doctor, Dr. Pate began a three-year ophthalmology residency at North Carolina State University. During this residency she received specialty training in the medical and surgical management of canine, feline, equine, food animal, and exotic animal eye disease. After becoming board-certified in ophthalmology, Dr. Pate worked in Charlotte, NC. 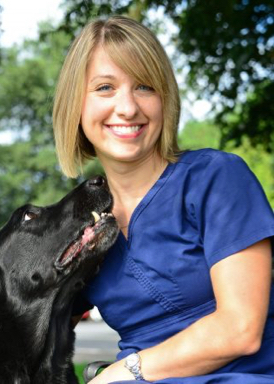 She joined Upstate Vet in 2012 to establish the first veterinary ophthalmology service in Upstate and Western North Carolina areas. Her clinical interests include cataract surgery and corneal disease. She enjoys her career because it “enhances the quality of life of our patients, by improving their vision and eliminating their eye pain.” Outside of work, Dr. Pate enjoys family life with her husband, two sons, dog, and cat. She loves spending time outdoors, staying active, and cooking for her family and friends.